Derrek Lee, Marlon Byrd, and Alfonso Soriano had three hits each to pace the Chicago Cubs in a series-ending 4-3 victory over the Pittsburgh Pirates on Sunday. The Cubs win ended a seven-game losing streak to the Pirates dating back to 2009. This one was all but a cakewalk for the much-maligned, well-compensated Cubbies on Sunday. Facing a 3-1 hole for much of the game, Chicago rallied for two runs in the bottom of the seventh against Pirate reliever Evan Meek, then went ahead in the bottom of the eighth on a Xavier Nady pinch-hit, go-ahead single off of DJ Carrasco. The blown lead wasted a solid effort from starter Ross Ohlendorf, who threw six innings of four-hit, two-run ball. 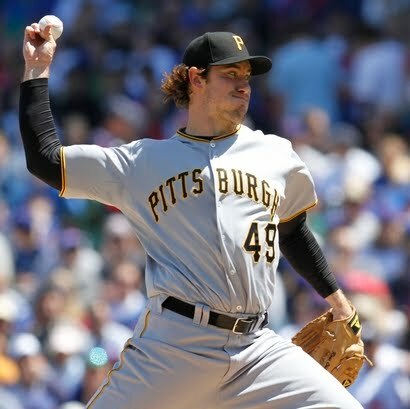 The Pirate bats were mostly quiet on Sunday, with only six hits off of Cubs starter Ted Lilly and none against the Chicago bullpen. Bobby Crosby had two singles for the Bucs, Ryan Doumit had the team's lone extra-base hit (a double) and Lastings Milledge drove in two. The 16-21 Buccos now travel to Philadelphia for a two-game set against the defending NL Champs starting Monday. Charlie Morton will face Kyle Kendrick in that one, while Zach Duke now has the task of dueling with Roy Halladay on Tuesday. I would like to know why in the hell Ohlendorf was sent up to bat with 2 on and 1 out in the 7th? He had Garrett Jones available on the bench to pinch hit and Russell leaves Ohlendorf to bat, then pulls him after one batter in the bottom of the inning. Between all of the stupid shifts, batting the pitcher 8th, and his cardboard cut-out like demeanor, I can't stand him as a manager. I am well aware he doesn't have much to work with, but that isn't an excuse for poor fundamentals. Imagine if the Steelers were lousy, so Tomlin would try to run HB passes, flea flickers, and triple reverses once a series.... I don't think that would go over too well. Agreed Burress...I don't understand JR either. But then again, I don't understand this team as a whole. They're consistantly inconsistant. This is a weak division (we are in 3rd as of today). Stop the nonsense, play the guys that give us a chance to win and stay out of their way. I know Church was a bit banged up but he needs to be in the lineup every day. Pearce and Clement are poop. And Aki needs to go away. I know he sat out yesterday but he has become an automatic out. I think what frustrates me most is we are in the mid-May and are still somewhat in this division race. Who knows where we would be had he made changes earlier. I find it harder and harder each year to lay blame for the suckitude of this team. Players under performing, management that doesn't spend (wisely), poor coaching etc. This year I have been mostly noticing the coaching. The moves or lack there of that JR has made so far leave me, only a casual fan, scratching his head. But I have to disagree with bohica, we are in a weak division, and in third place, but I don't believe we are anywhere "in the race" or even competitive at the major league level at this time. we just don't have the talent. That is very true that we lack the taltent to compete, even in a weak division. I just can't believe major league players lack the fundamentals that are taught in little league. For instance, last friday night's game against the Cardinals was a perfect example of simply looking clueless from the standpoint of simple baseball smarts. Andy LaRoche and McCutchen getting double off while Beasley stood there and watched, Iwomura not simply swiping his tag on the SB that turned out to win the game, and easy grounders being hit through the shift are just embarassing. Almost as embarassing as Milledge's "home run" celebration........ and to think, Polish Night at the ballpark was the night AFTER all of this stupidity.